Mango Peda or Aam Peda is one of the lip smacking mango recipes which is packed and flavoured with fresh mango puree. Mixing this with milk powder and condensed milk will make this a perfect dessert for the summer. This could become a delicious dessert for any festive occasions, parties which is really easy to make when you want this quickly. 1. Take a small bowl and prepare cornstarch paste or flour paste by mixing in a tablespoon of cornstarch in a tablespoon of cold water. 2. Now make ready a plate. Grease a plate with some ghee and keep it aside. 3. Now, take a big bowl and mix together – condensed milk, milk powder until it would become a thick and smooth paste. 4. Now, add 2 Tbsp of melted ghee and mixed everything. Keep it aside. 5. Now, lightly heat a nonstick pan and add mango puree in it. Now, add the prepared corn starch paste, condensed milk in the mango puree and mix everything well. 6. Now cook it on medium high heat until the peda mixture thickens. 7. Keep scraping the bottom and side of the pan. 8. After few minutes, add cardamom powder (optional) and continue cooking till the mango peda mixture starts thickens and leaving the pan and forms a dough. 9. Now, remove the mango peda on a grease plate and let it cool till you can handle the hot peda mixture with your hand. 10. After 5 minutes, grease your palm with ghee and take a tablespoon of the aam peda mixture on your palm and shape up into a ball. Press it a little to give a shape like disc or peda and place it on a plate. 11. 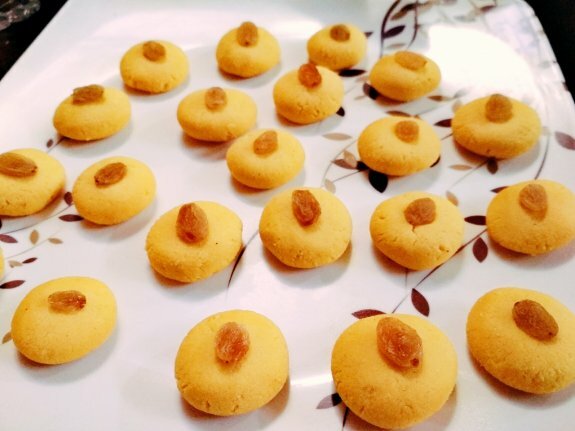 Repeat the same process for all the Mango Peda and garnish it with raisins on top of each peda. Serve this Aam Peda or Mango Peda recipe as a little bite on your dessert with your lunch or dinner meal.